Russian-born publisher Albert Lewis Kanter had the idea to introduce children to classic literature through comics. In 1941 he created Classics Comics. In 1947 they became Classics Illustrated and run until 1967.In Greece they were translated and published by Atlantic Publishing Co. Ltd., starting in 1951 with 153 titles, first fortnightly and then weekly, with a reprint in the 70s and another one in the 90s. Many of us were first introduced to favorite books as children by these very popular illustrated comics. 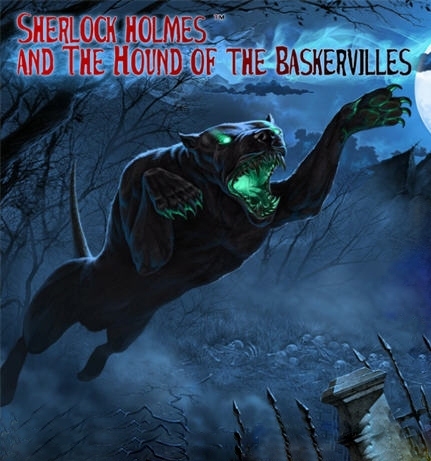 Arthur Conan Doyle’s The Hound of the Baskervilles had this great cover showing a menacing Great Dane. The above is from the 1990’s reprint. Below is the original American edition, no. 33 in the series. The artist was Henry Carl Kiefer. I think this cover is his most famous, probably also his best signature work. but not such a hound as mortal eyes have ever seen. its muzzle and hackles and dewlap were outlined in flickering flame. We do know about the 1931 / 1932 Hound’s protagonist, in the British Gainsborough Pictures production, starring John Stuart as Holmes. The Great Dane was Champion Egmund of Send, from the famous Send kennels of Gordon Stewart. Egmund was born on Jan. 29, 1928 by German import Urlus Volbloed of Send x Beryl of Send, so he was around three years old at the time. Both pictures below are from Robert E. Heal’s book, The Danes of Send Manor The Life, Loves and Mystery of Gordon Stewart, published by Stoddard in 2001. Egmund was obviously a great canine actor, displaying all the intelligence, trainability and willingness to please so typical of the breed. I just don’t find him scary though. I haven’t seen the film though and these are only stills from the set, so perhaps it actually works on screen. No doubt credit is also due to the Send kennels’ trainer, Bob Montgomery. We also know a few things about the next Hound, in the iconic 20th Century Fox 1939 film, starring Basil Rathbone as Holmes. The Great Dane was a blue dog called Blitzen (German for ‘lightning’). Due to the antipathy for Nazi Germany, as it was 1939 and Hitler was unleashing his blitzkrieg over Europe, they changed the dog’s name to ‘Chief’. It is reported that the dog weighed 156 pounds (70kg). there is a head screenshot of the dog here. In 1959, in the British production by Hammer Film, starring Peter Cushing, the Hound was played by a brindle Great Dane wearing a head mask. You can see some pictures here. This was the first movie adaptation in color and, together with the Basil Rathbone film, its considered a classic. Great film, that you can watch in full here, but personally I don’t think the mask really works. The above is a screen shot where the dog attacks Christopher Lee, who was playing Sir Henry Baskerville. In 1983, Ian Richardson played Holmes in a British television adaptation of the myth. The Hound was portrayed by a black Great Dane. Jeremy Brett played Holmes in the BBC series “Sherlock Holmes” which aired between 1984-1994. The Hound episode aired on 31st of August 1988 and the dog was a natural eared fawn Great Dane, although they used a black crop-eared puppet for close-ups. If a reader happens to have more information about any of these unidentified Great Danes that appeared in the Hound of the Baskervilles films, I’d be thrilled to find out. And that, I think, is the last Great Dane hound of the Baskervile myth. Incidentally, Benedict Cumberbatch is an interesting Holmes of the troubled hero genre, shifting the focus from the enemy without to the enemy within – but his modernized tale and Hounds did not scare me and the rendition failed to draw me in and involve me. I found Robert Downey Junior’s Holmes much more thrilling, refreshing and intriguing on many levels – both Guy Ritchie’s installments were visually stunning and Jude Law an excellent Watson, a sensible and likable counterweight to Holmes’ mad dashing genius. Can’t wait for the third installment that’s in the works as I write! For the fans, I found some more interesting illustrations here, here, here and here. 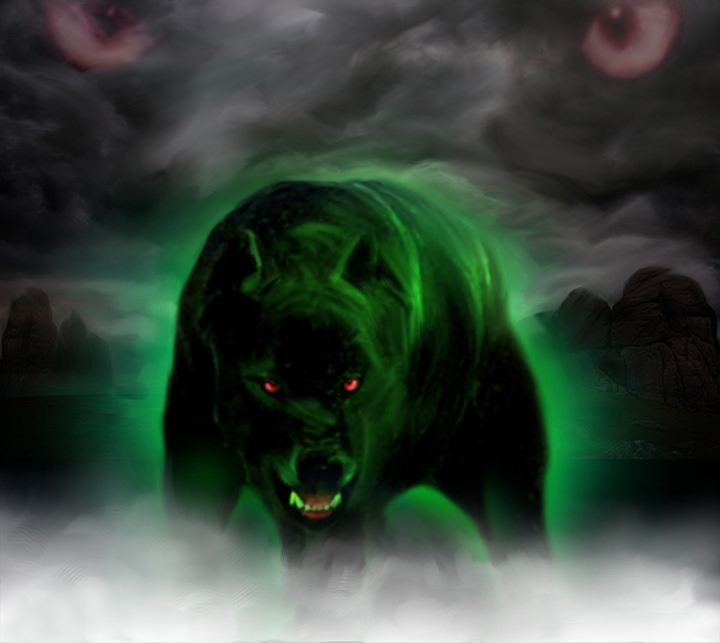 For all the modern technology, CGI and digital imaging and gimmickry, I still can’t think of a better way to actually make the Hound of the Baskervilles a believable horror story than to use a real, flesh and blood dog, adding realism to the myth and invoking the primordial fear in the viewer’s subconscious; that’s exactly why this particular story has such a firm grip on readers’ imagination since it was first published in 1901/1902: it plays with the mortal fears of the human psyche, fears of nature’s powers, of the unknown and of monstrous beasts lurking in dark, those fears that have been embedded in the collective memory since the times our primitive species was struggling to survive amongst much more powerful creatures and imagined supernatural forces; and no better dog than ours, to flesh out the myth, provided the director can make the most of it – which in fairness, I don’t think has been quite well done yet. For me, the book is forever linked with the breed. Probably ’cause of those comic book illustrations of my childhood. The Dark Dog myth hasn’t aged. It is also quite probable that Conan Doyle the mysticist was familiar with the tales about the yeth hound or yell hound, a legendary black dog found in Devon folklore. Ever since Cerberus the dog of Hades in ancient Greek mythology such legends persist; Conan Doyle’s rich Celtic heritage was rife with them and he was, due to his personality, experiences, interests and imagination, as well as the definitive influence of the other Celt and Great Master of the macabre, Edgar Allan Poe, uniquely poised to exploit and breathe new life into them. May myths live long and prosper, continuing to entertain and thrill us. Falkhor – a Great Hound for the Baskervilles candidate that would win my casting vote to reprise the role on the silver screen ! Even chillier in black and white, as Falkhor the French Great Dane is charging at the viewer like a creature out of our worst nightmares – look at those fangs !